Oh. My. God. I literally just finished this book about 2 minutes ago and I already know it's one that will stay with my for a LONG time. This book is SO powerful in its message and tone and really, I am just a bit dazed right now. People seem to either love or hate it and I can see why. Fracture by Megan Miranda is brutal and it's honest. 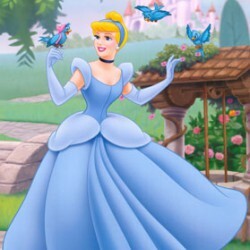 It's not sugarcoating anything about what is happening in the story: a girl surviving something she shouldn't in all likelihood have survived. This is not something that will leave you being okay after, or at least not right away. And of course your parents aren't going to be okay, this is not something you come back from easily. Delaney isn't necessarily a likeable person but she is very easy to relate to. She died and then she lived and then she discovers she can feel when people are about to die. Of course she's scared and lashing out! Sometimes the honesty in Megan Miranda's writing was almost painful, but I wouldn't have had it any other way. And can I just say that I really liked Decker? I mean, he does some seriously stupid stuff, but he's a good guy and he cares about Delaney. And he READ to her when she got headaches from reading. I really don't need another reason to like him. The only thing is, I kept wondering thoughout the novel if Delaney's survival or her newfound abilities would be explained and I'm kinda bummed that they weren't. The scientist in me is dying to know! 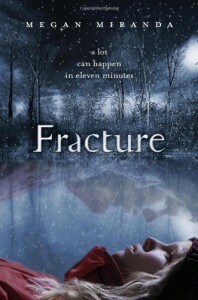 Fracture was brutal and honest and totally compelling and it's a story that will not be easily forgotten. I can absolutely see why it's not for everyone, but I really enjoyed reading it. This was a very powerful debut and I'm looking forward to finding out what Megan Miranda will write next!